Putting my experience abroad in a nutshell, I’d have to refer to one paraphrase: personal enrichment! Having spent six months in Beijing made me realize that China has far more to offer than one may think. Not only did I personally develop and meet wonderful people along my journey but from a professional perspective, acquired new skills and gained experience in a field of work not known to me before. When working for the Embassy of Switzerland in Beijing, change is pre-scheduled. I like change, as it often brings along challenges and maintains interest. For six months I had the chance to be a part of the Science, Technology and Education (STE) section. With China rising as a technological power and the fourth industrial revolution approaching, the STE section definitely keeps you on your feet. Artificial Intelligence, Big Data or Space Missions are just some of many interesting topics crossing your professional path during your internship at the Swiss Embassy. 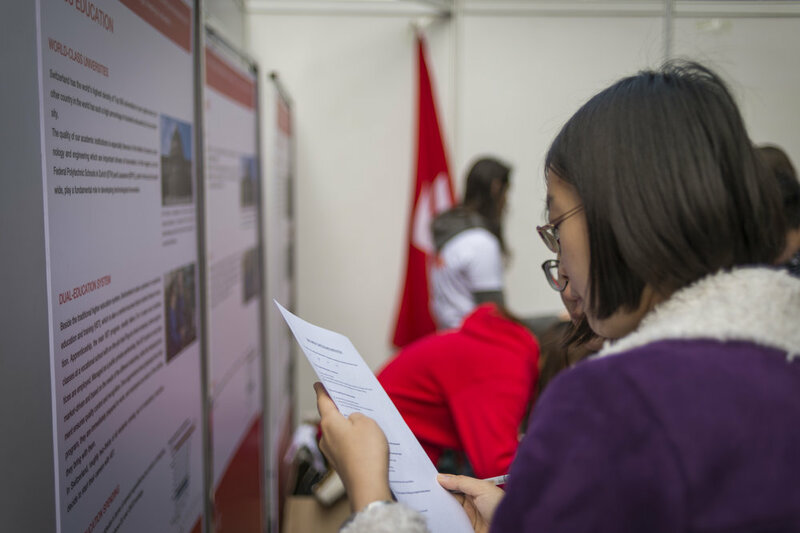 The tasks of an intern range from reporting about the newest trends in the field of research and innovation in Switzerland and China to organizing projects, delegation visits and alumni events. A special highlight for me was Federal Councilor Johann Schneider-Amman’s visit to China for an economic and scientific mission in September 2018. The time spent here allowed me to build up a personal network, master challenges, and broaden my horizon. It was a pleasure working for the worldwide biggest Swiss Embassy with a highly motivated and international team, and getting the opportunity to share knowledge and exchange experiences. Looking back at my time in Beijing, I am sure of saying: Time flies when you are having fun… I am grateful for having had the opportunity to be here and take with me many valuable experiences along my way. I dearly hope that this hasn’t been my last time in China. A special thanks goes out to my working colleagues and friends for their support and for making this trip a journey which won’t be quickly forgotten. Until soon! Zàijiàn! Nathalie Loeffel is visiting the Forbidden Palace in Beijing during her internship. Be it the cup of coffee that you had with friends sitting on the staircases of the university building, or the cup of coffee that accompanied you late at night when you were trying to finish course assessment before the deadline, almost for sure, there is always a cup of good coffee deep in your memories of your student life in Switzerland. That's why we thought about offering the alumni of Swiss schools and universities an unique opportunity to make their own coffee with professional coffee-making guidance given by Nespresso Coffee Ambassadors and to recall their memorable experiences in Switzerland while enjoying the coffee on the occasion of the All Swiss School & University Alumni Gathering, which took place at the Embassy of Switzerland in Beijing on 21st October 2016. Invited by the Ambassador of Switzerland to China, H.E Mr. Jean-Jacques de Dardel, and Science Technology and Education Section of the Swiss Embassy in Beijing, together with contribution from swisslearning and support from Nespresso, over 100 alumni from Swiss schools and universities participated the gathering despite the raining weather. The drizzling night was immediately warmed up by the Nespresso Barista Workshop - 4 tables on which Nespresso Coffee Machines and various ingredients were nicely presented with a Nespresso Coffee Ambassador standing beside each table waiting for the guests. Each of the participants got a seat at the one of the tables and took on the journey of exploring the dynamic world of coffee-making presented by Nespresso and finally made their own cups of coffee with their choices of flavor. Filled up with the excitement of the alumni from their achievement at the workshop, the night was further highlighted by the Ambassador's welcome speech. Ambassador de Dardel has been attaching great importance to alumni events as he values significantly the ties created by students from both countries. He invites alumni to get together at his residence on a regular base in order to let the them continue their close ties with Switzerland after their studies, and it's a great pleasure to see that the alumni enjoy and appreciate such kind of opportunities evidenced by their enthusiastic participations. The Ambassador's speech was followed by a buffet reception including raclette made with Swiss cheese that we ordered from Switzerland especially for this evening as well as Swiss wine. Authentic Swiss food like a time machine that carried all the guests back to Switzerland and opened up warm exchanges among the alumni no matter if they knew each other before as Swiss food is their shared memory and common language. It is our wish to provide opportunities for alumni to meet up once in a while to catch up with old friends and make new friends, and to feel that their study experience does not finish after their returns, it is in fact a long-lasting story which will develop further with new elements added over time, and we are here to support and connect each of them. By Science Technology and Education Section of the Embassy of Switzerland in Beijing. In the light of the upcoming 47th St.Gallen Symposium in May 2017 focusing on “Disruption”, the Embassy of Switzerland in China had the great honour to organize the 8th St.Gallen Symposium Beijing Reception on November 30th 2016 to discuss this hot topic in the Chinese context. October 23 could have been a dull and cold Sunday, announcing the beginning of a long and harsh winter. 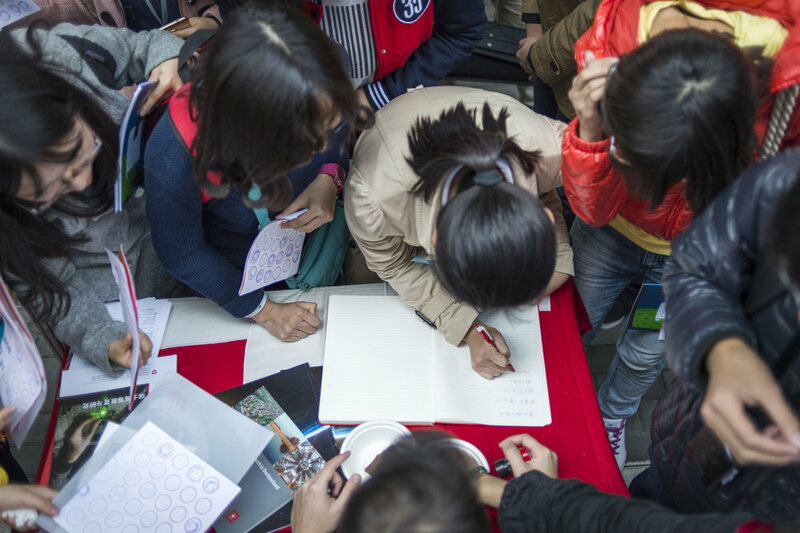 This was maybe true everywhere else in north China, but definitely not at Peking University where the annual International Culture Festival took place. 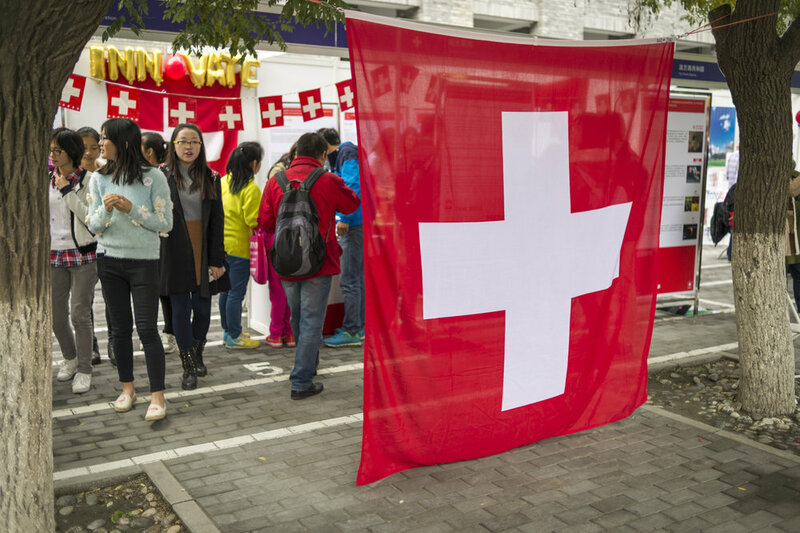 Among the 60 countries promoting themselves to thousands of visitors, the Swiss booth had the honour to be the largest one. While our country benefits from a positive image in China, its achievements in the fields of innovation, education and research remain usually unknown to the general public. 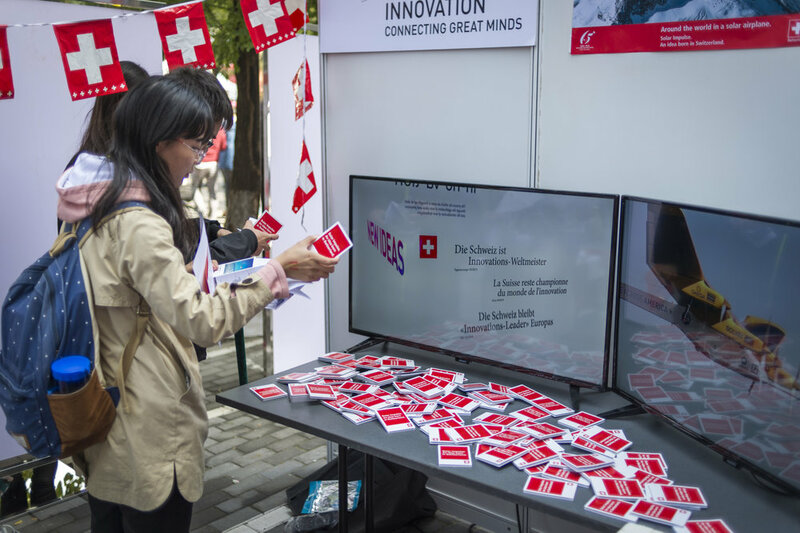 For this reason, our Swiss booth focused on the theme of Innovation, with a powerful slogan printed on the t-shirts of our dedicated team of volunteers from the Swiss Embassy and Peking University: “We Innovate”. In order to deliver this message, the Swiss booth presented several explanatory panels highlighting Switzerland’s innovative strength and competitiveness, the key factors behind its success and some concrete examples of Swiss innovative projects and researches. This message was further promoted with TV screens broadcasting different videos about Swiss innovation. Furthermore, visitors also had the chance to try the smallest portable wireless scanner of the world and a cutting-edge scanner mouse invented by a Swiss start-up (Dacuda). More than a simple exhibition on innovation, the concept of our Swiss booth was to provide both a culinary and intellectual experience at the same time. 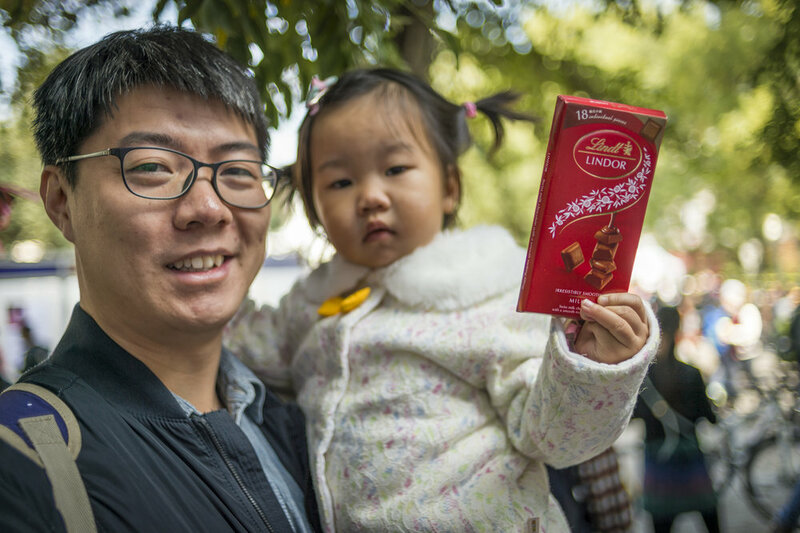 For food lovers - and no doubt that Chinese people are - we had an almost endless mountain of chocolate bars provided by our generous sponsors Lindt and Nestlé, as well as a chocolate fountain allowing our visitors to try some melted chocolate with fresh fruits. 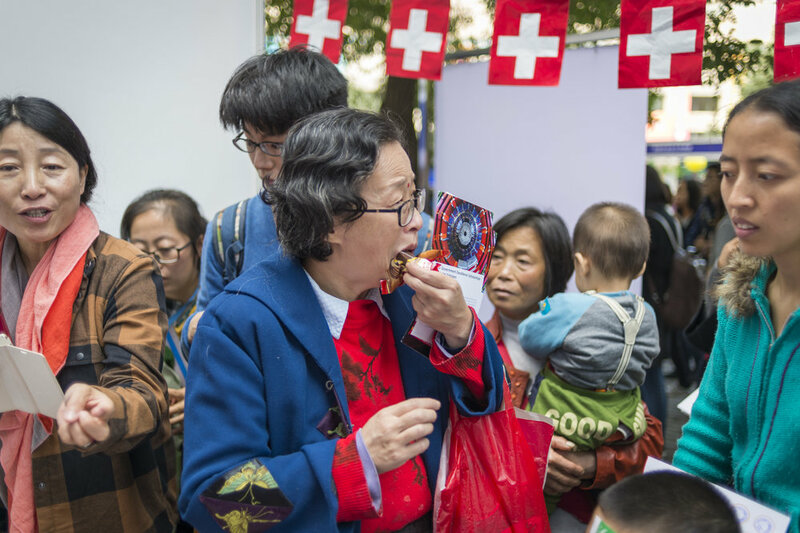 However, in order to have the right to taste our mouth-watering chocolates, visitors had first to submit a quiz about Swiss Innovation. The answers could be found on the panels with the help of our dynamic team of volunteers. At the end of the day, what seemed a never-ending chocolate mountain in the morning had disappeared. The successful promotion of Switzerland’s innovation in a stimulating and pleasant atmosphere was not only reflected in the great smile of the thousands of visitors, but also in our guestbook where visitors could leave comments. We received some very friendly and touching messages such as « I Love Switzerland » or « Switzerland and China are forever friends », as well as many messages praising our booth to be the « best» and the «most technologically advanced» one. Lastly, many comments proved that our booth was able to raise awareness about Switzerland’s innovative strength: « Switzerland is really an innovative country, impressive! ». “With the right policies and services in place, population ageing can be viewed as a rich new opportunity for both individuals and societies.” — Dr. Margaret Chan, Director General, World Health Organization, in the Preface to the 2015 World Report on Ageing and Health. On the occasion of a delegation visit from Swiss universities of applied sciences consisting of experts in the area of ageing, the Embassy of Switzerland in China organized a panel discussion and reception with respective Chinese colleagues on the Topic: “The Future of Ageing in Switzerland and China: Trends, Challenges and Opportunities“. Before the panel started, H.E. Jean-Jacques de Dardel, Ambassador of Switzerland to China, welcomed the audience to his residence and reflected in his welcome speech on the health care developments in Switzerland. Prof Liu Fang, Deputy Director of China Research Center on Aging, then held a keynote speech on the latest developments of ageing in China. Her speech included the latest results of a survey the research center recently conducted whit the aim to better understand current living conditions and needs of the elderly. The inauguration of the Beijing Chapter of IHEID Alumni Association took place on July 26th 2016 at Residence of Embassy of Switzerland in China. The event was attended by more than 30 alumni, embassy staff and guests. For the purpose of the 120th anniversary of Xi’an Jiaotong University and the 60th anniversary of the First Affiliated Hospital of Xi’an Jiaotong University School of Medicine Lara Fritschi, Attachée to the Science, Technology and Education Section (STE) of the Embassy of Switzerland in the People’s Republic of China was kindly invited to hold a presentation on the Sino-Swiss Science and Technology Cooperation (SSSTC). When the air smells of Indian curry, the sound of South American beats makes you want to move your body and you casually take some selfies with Barak Obama and Roger Federer, you definitely are at Tsinghua University’s Global Village. A green and sunny Beijing welcomed the EMBA students from HEG Fribourg School of Management on April 11th for their China Study Week 2016, organized by the Science, Technology and Education Section of the Embassy and swissnex China. Apart from celebrating the beginning of spring, the Science, Technology and Education Section of the Embassy of Switzerland in China was happy to welcome the delegation from the University of Applied Sciences and Arts Northwestern Switzerland (FHNW) for the 7th time since 2009 for a joint lecture at the Embassy’s Residence. When the Christmas lights turn on at the residence of the Swiss Embassy, the mulled wine is being warmed up and the air smells of Swiss Raclette cheese, then it is time for this year’s Exchange Students and Alumni Gathering. This year’s edition of venture leaders China stood once again in the spotlight of 10 innovative Swiss entrepreneurs, starting in Beijing with an intensive three-days program involving various business experts, entrepreneurs and investors. The exchange program is expected to enhance the students’ understanding of the two countries, promote youth exchanges and boost cooperation in the cultural and educational fields. On July 7th, and after the completion of a successful 2nd Swiss Day at Beihang University, Prof. Claude Nicollier fascinated invited guests with a presentation at the Residence of the Swiss Embassy. On 24 June 2015, the Science, Technology and Education Section at the Embassy of Switzerland in Beijing hosted a preparatory workshop for Chinese outgoing students in combination with a summer barbeque, for which alumni of Swiss universities were also invited. Lecturers of the PH Zurich taught a school class in China during APAIE conference they attended in March, 2015, Beijing.